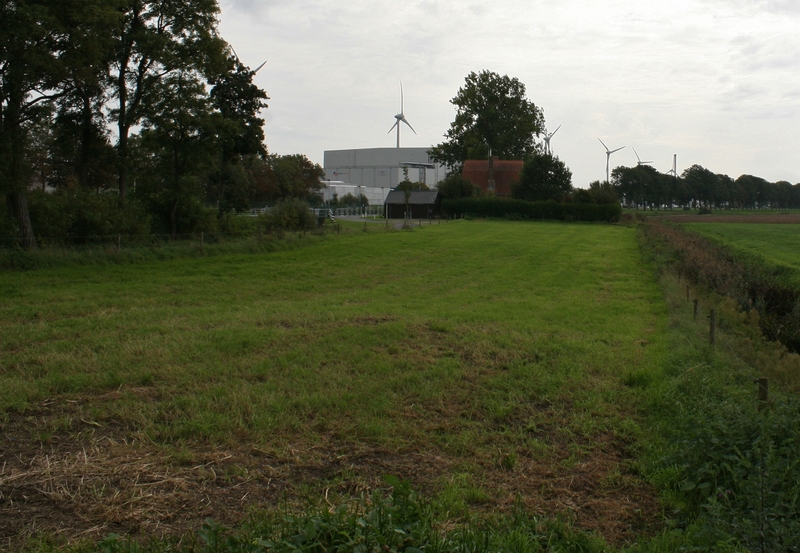 Two thirds of a mile due north of Talana Farm Cemetery, we find ourselves at the railway station in the southern outskirts of Boesinghe, this view looking west. 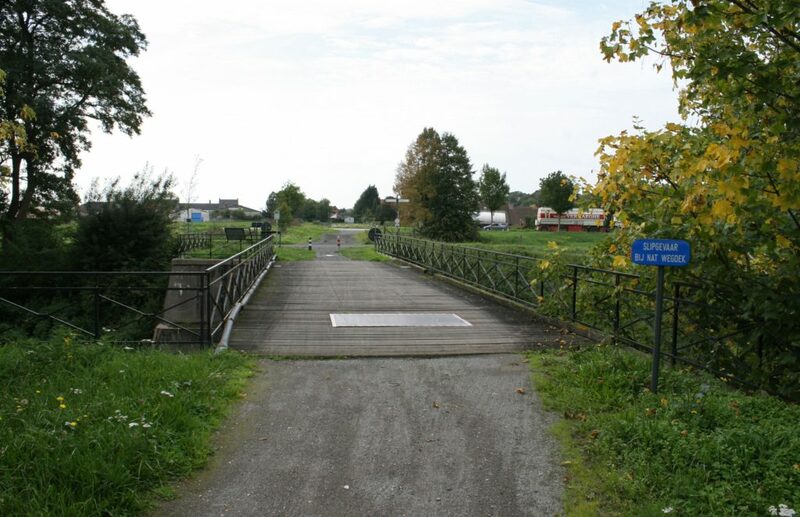 …and it is the old railway bridge that we are heading for in this post. 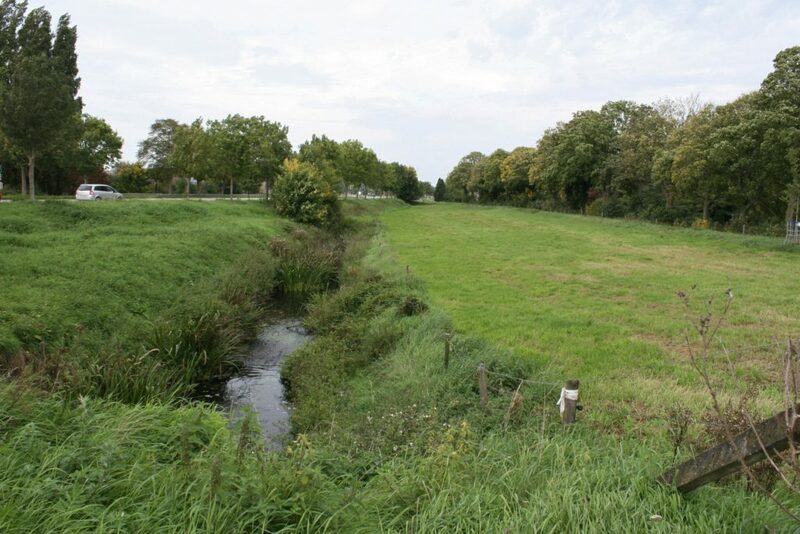 The ditch in the foreground carries the Ieperlee, as it follows the course of the canal north. 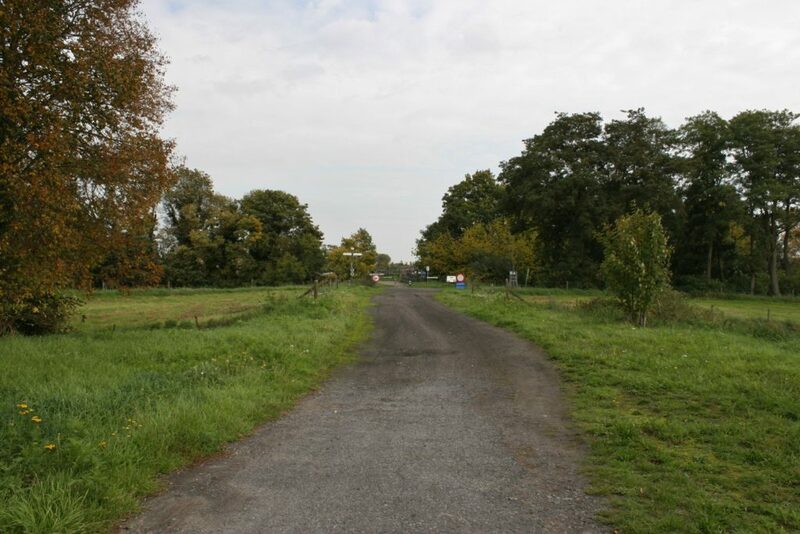 …looking north, the unkept piece of land between the stream and the road on the left still, perhaps, showing faint traces of undulations. 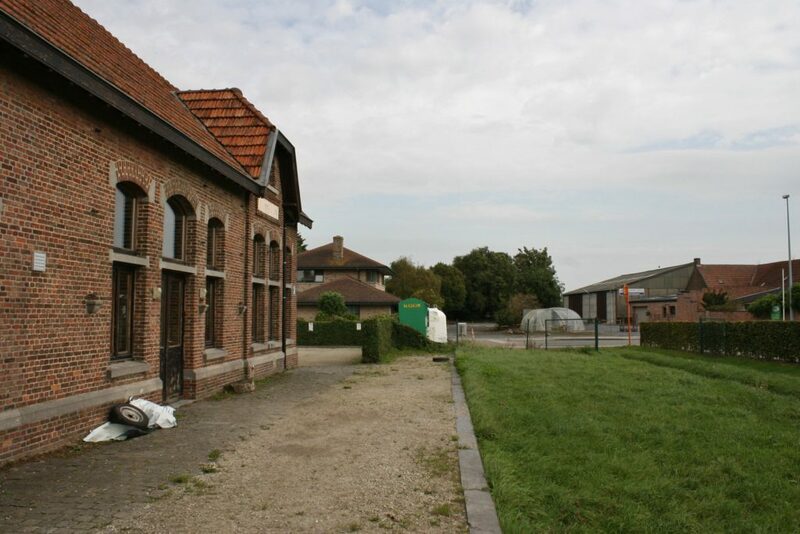 Once the Second Battle of Ypres was over, the French front line trench snaked its way across the field on the right for the next two years, as you will be able to see on the trench maps coming up later in the post. And a reminder, before we go on, that when I use the word ‘trench’ in this post, indeed on this tour, I will only rarely be using the verb ‘dig’ to accompany it. The digging, apart from in one or two places, such as on the slight ridges held by the Germans north east of Ypres, and of course on the raised canal bank we have seen in a few of the previous posts (most notably at Essex Farm, if you remember) consisted of just a few feet, most trenches having to be constructed largely above ground due to the high water level, the Ieperlee showing this fact perfectly in the above photograph. 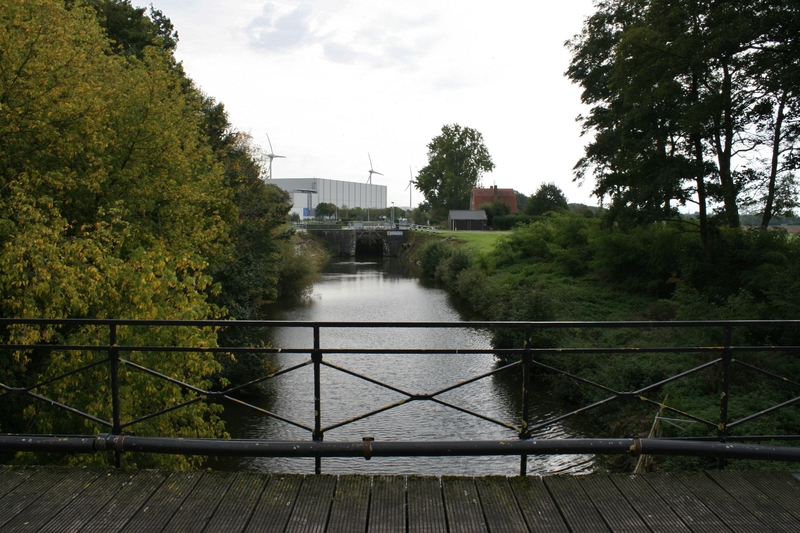 Looking south from the same spot, the wind farm within the huge industrial estate that has grown up over the last fifteen years on the eastern side of the canal in the background. South of the bridge the French front line was, for a short section, quite literally the canal bank itself (extreme left). 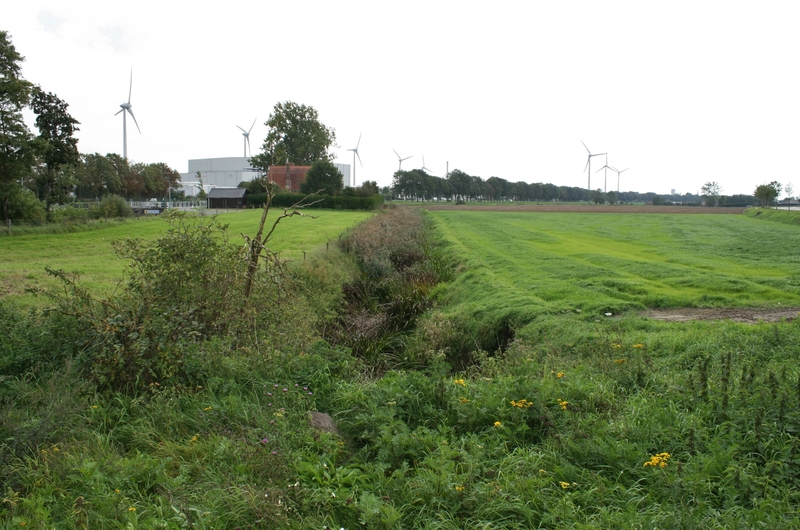 The front line to the north of the bridge became the support line here, running beneath the railway embankment on which we are in effect standing, and following the right bank of the Ieperlee across the fields in this picture, linked to the front line trench by a number of short trenches crossing the field on the left, again as you will be able to see on the later trench maps. 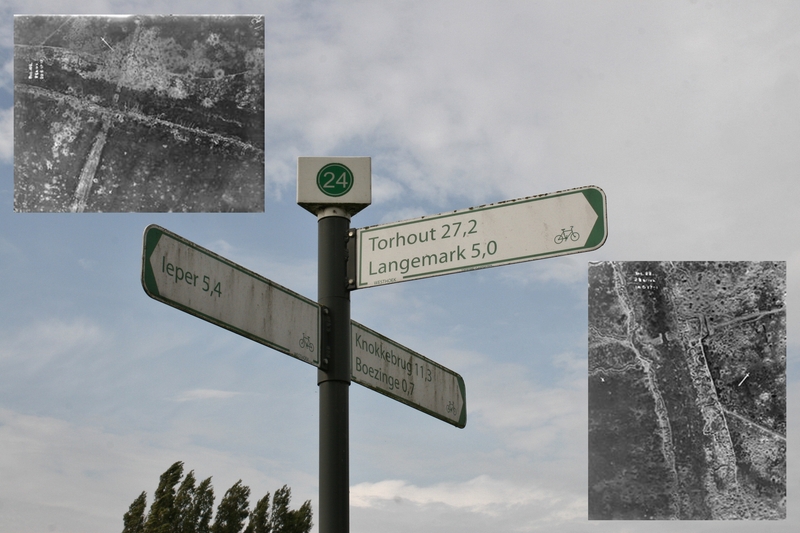 …the lower right photograph on this one (the other is very old and very illegible), taken in 1915, worth enlarging. 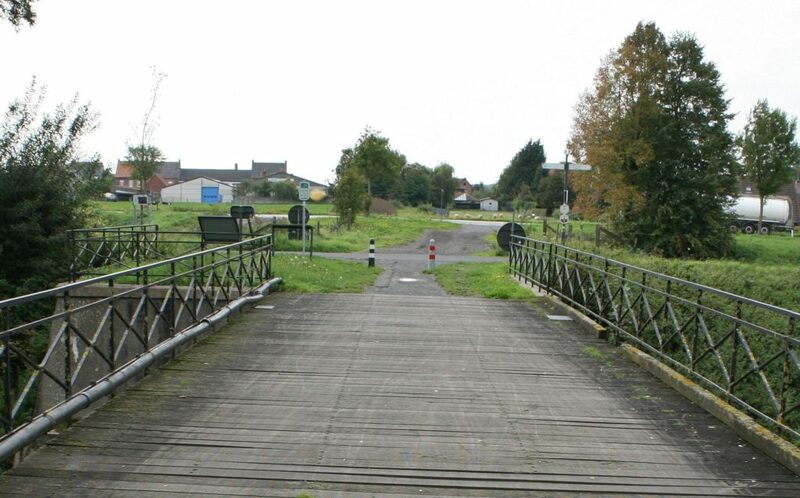 The railway bridge is the lower of the two bridges. 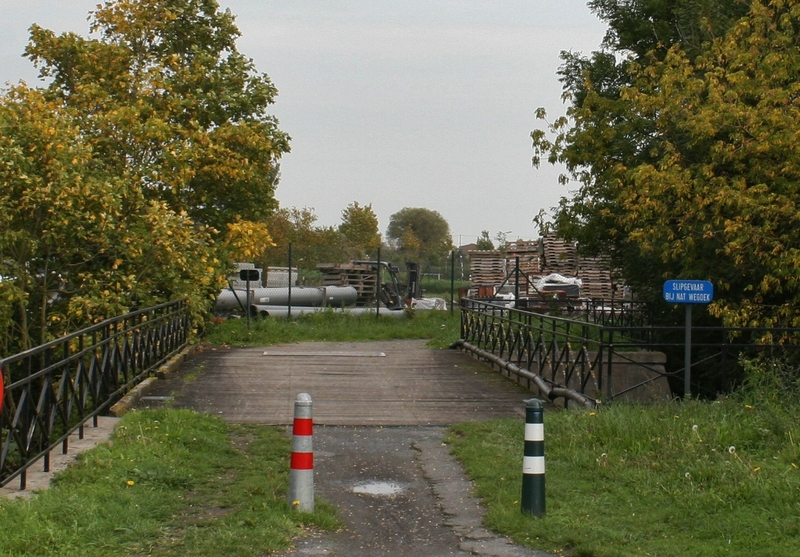 The other photos show two of the British-made crossings (the one lower left could hardly be called a bridge) spanning the canal. 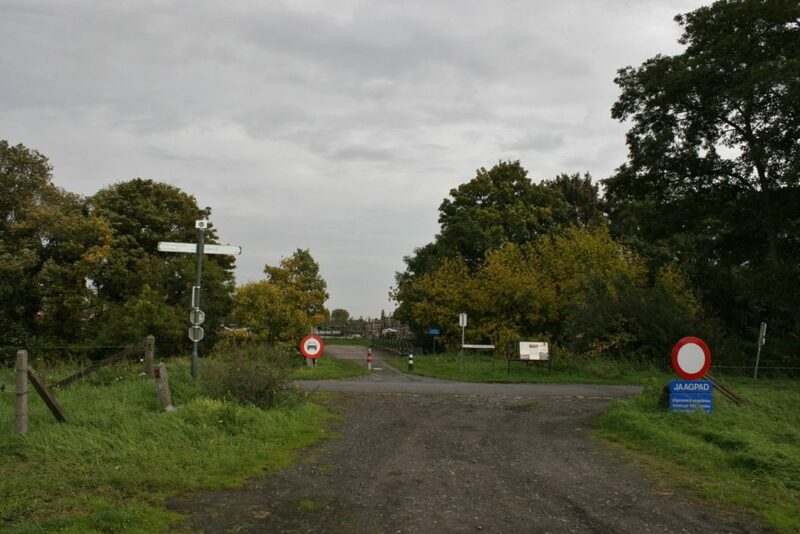 International Trench, the objective of the 6th July 1915 raid that I mentioned previously (and will again), is only a few hundred yards from the bridge, away to the south east. 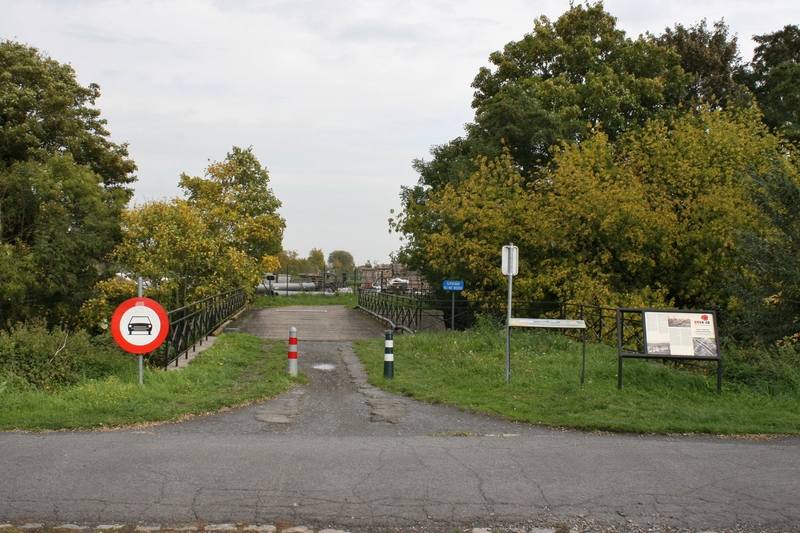 …where the site of these lock gates mark the very northern end of the Ypres Salient, as the trench map below shows, although the lock itself was not built until the 1930s. 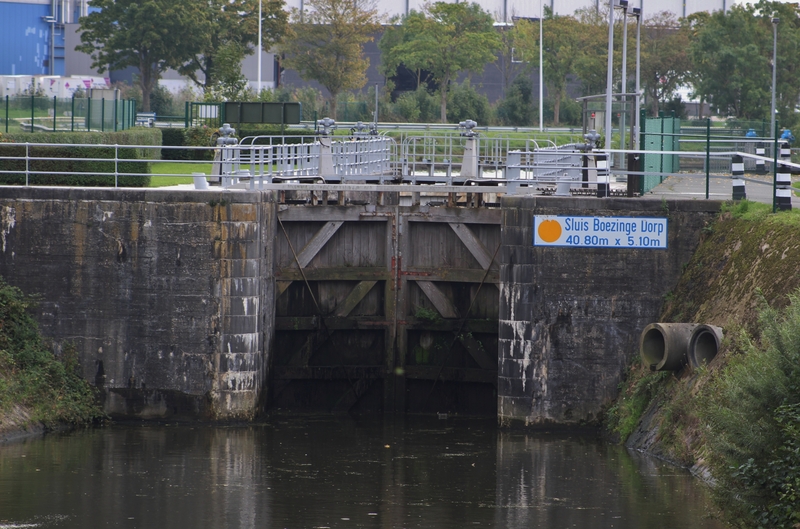 The lock also marks the division between the French Army and the British Army; from here south, the Salient itself was the responsibility of the British; to the north, on through Diksmuide and the inundations further north as far as Nieuwpoort on the coast, where some British troops were stationed in 1917, French and Belgians would hold the line for the rest of the war. 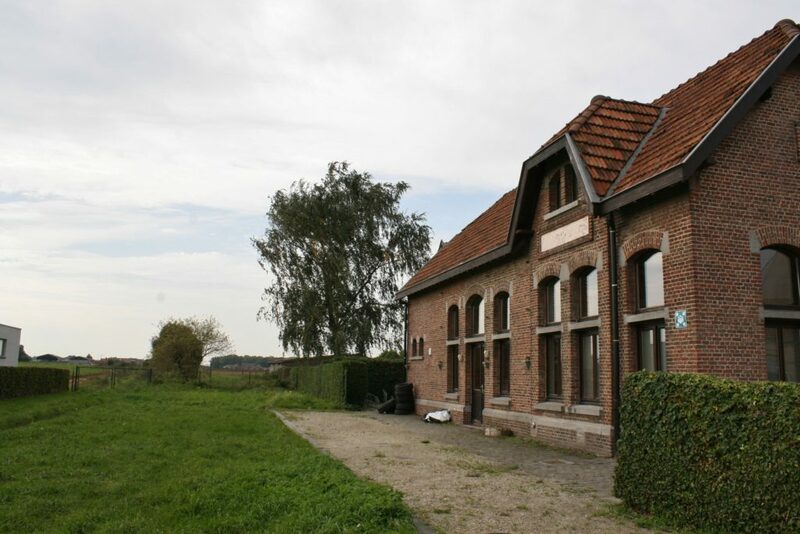 …you will come to the point where the British took over from the French, and where the British front line crossed to the east bank – the very northern tip of the Ypres Salient. 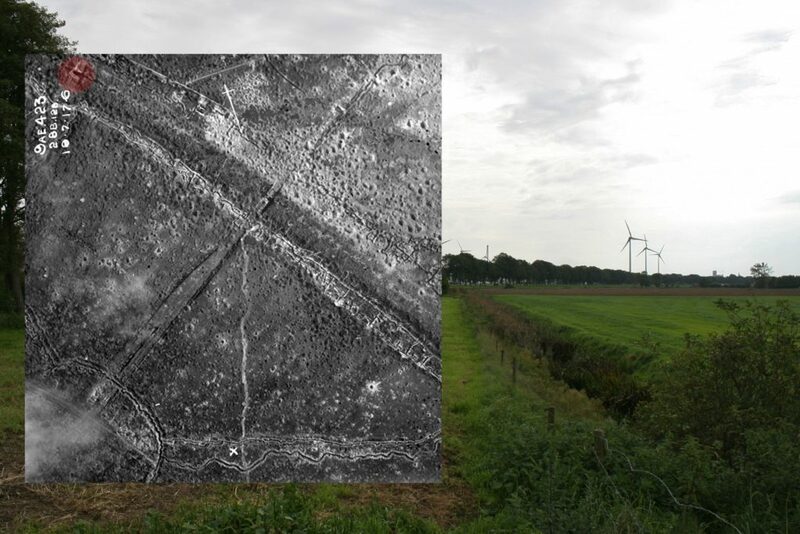 And if you look really closely at that point, you will see that Canal Trench actually overlaps, and runs behind, for twenty or thirty yards, the British front line! 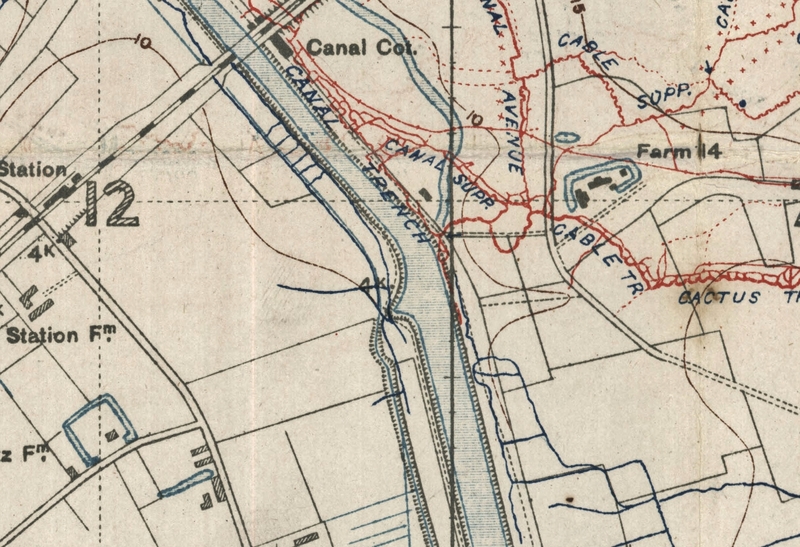 Bearing in mind there are more British front line trenches along the western canal bank immediately opposite, you would suspect that this southern tip of Canal Trench was untenable, but pity any poor German given sentry duty there – and indeed any British sentries in the overlapping section of the British trench too! 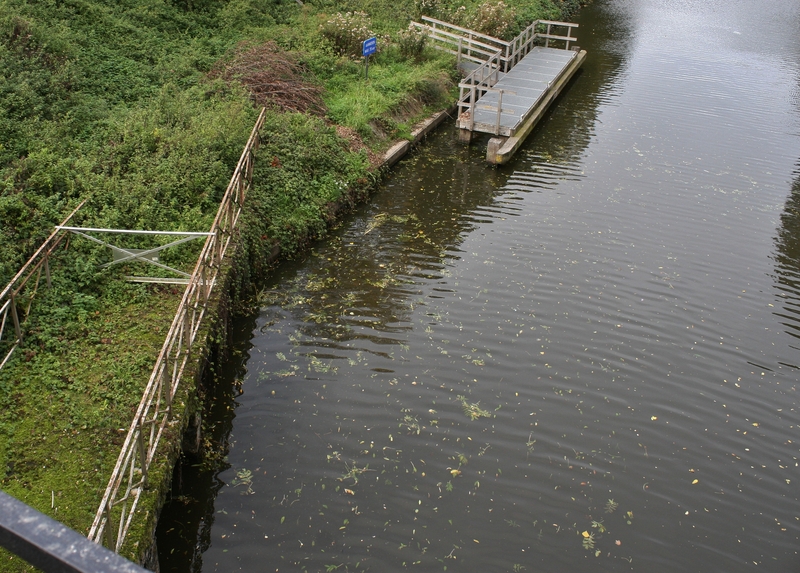 One wonders what is still down there, deep in the mud. I think we know. 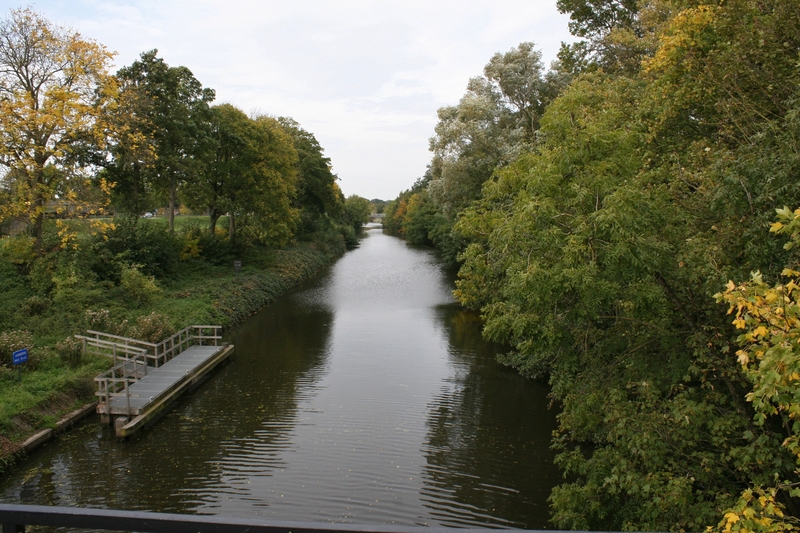 And here we are on the eastern side, standing in effect on the German parapet looking towards the French front line, a couple of hundred feet or so away across the canal. 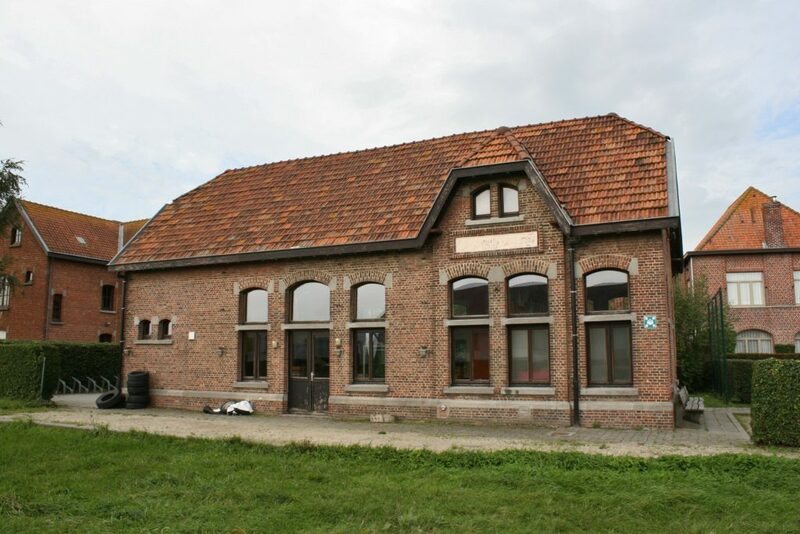 On the evening of 22nd April 1915, following their first use of gas, the Germans pushed as far as the bridges across the canal at both Lizerne and here at Boesinghe, where a ragtag group of defenders including Zouaves, French gunners and territorials, having barricaded both Boesinghe bridges (there’s a road bridge a little further north, as the first trench map, and the photo on the information board, show) forced them to dig in here on the eastern bank. We shall return to this action, from the defenders viewpoint, a little later in the tour. 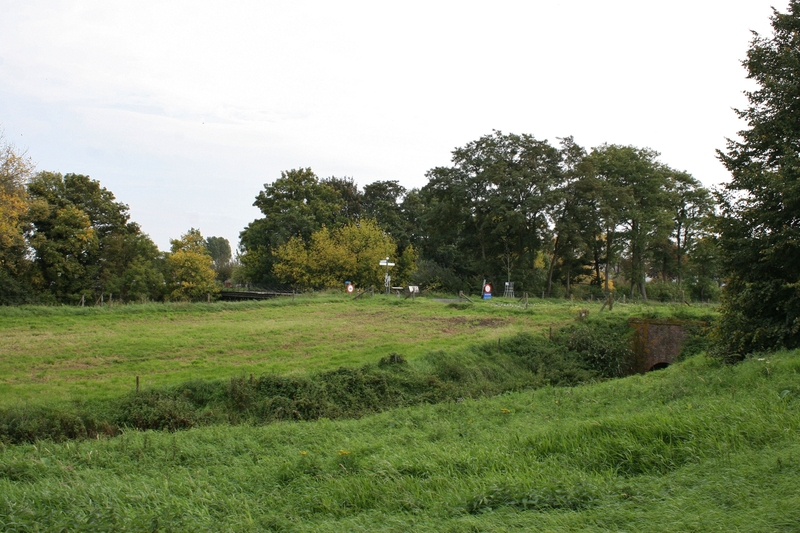 In the meantime, for two years, this is the view from one front line across the canal to the other, the French front line incorporated into the actual canal bank across the canal to our left, and a little further back in the field on the right, as we saw earlier. 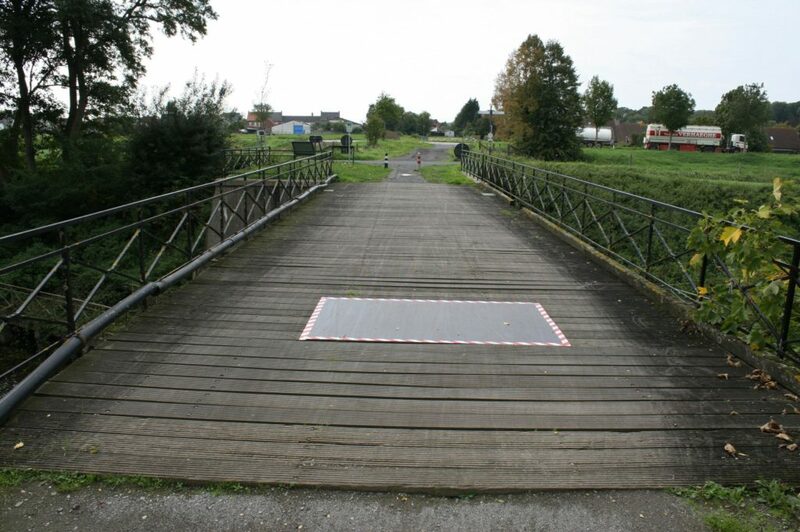 The centre of the bridge was demolished, and neither side could send out wiring parties to wire the canal banks; the front lines were too close and there was simply no cover. 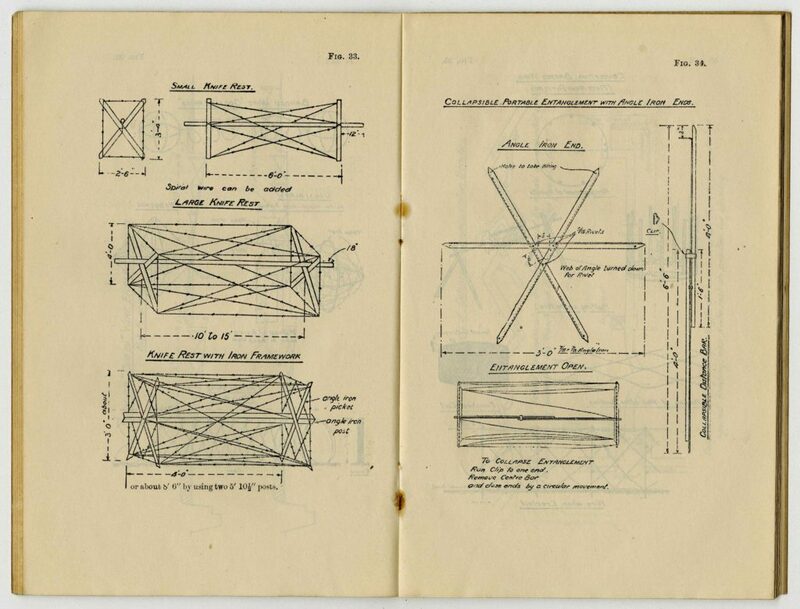 Pre-fabricated barricades, including cheveaux de frise (see below), were brought up to the French front line and then pushed out, over the trench parapet, along, I am sure, with anything else they considered suitable for use from the battered village behind them. 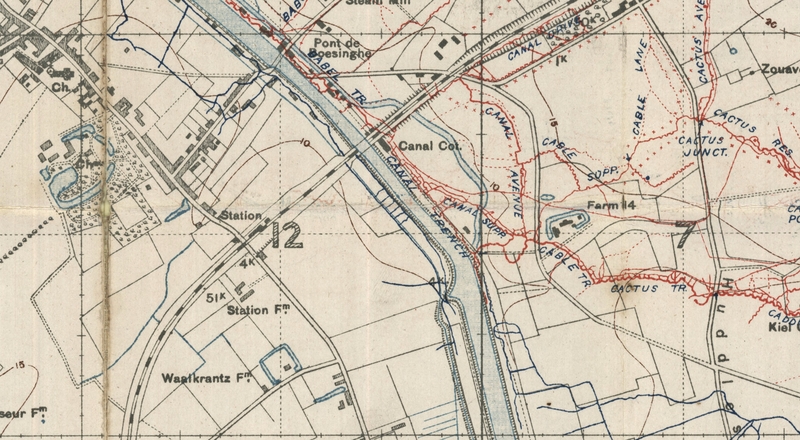 The British too used their version of the cheveaux de frise – the knife rests in the above diagram borrowed from ‘Notes on Trench Warfare for Infantry Officers’, the December 1916 publication from which I have already promised, and will keep my word, to show you further extracts at some point – a few hundred yards south of here, lining the eastern canal bank to prevent German infiltration behind their lines. As we begin to retrace our steps across the bridge, the group of trees in the distance directly ahead of us are, by the way, the ones I suggested you remember, from the other side, when we were at Boesinghe station. 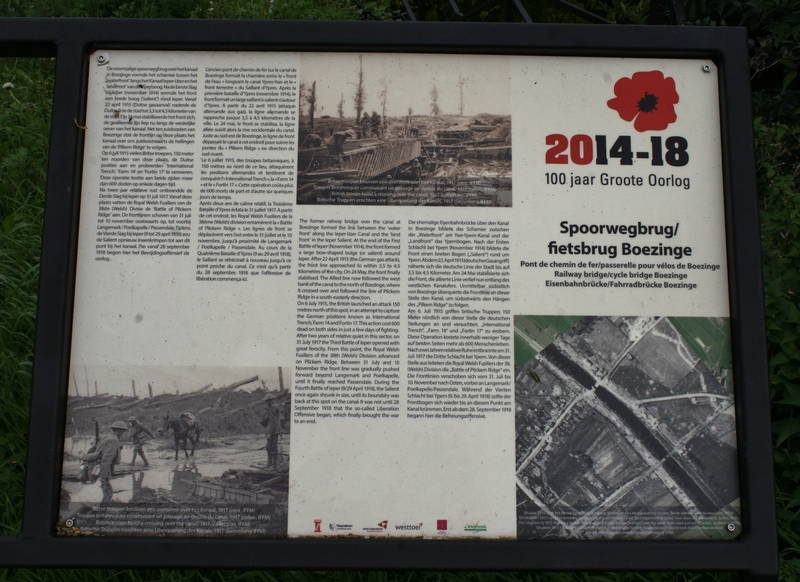 This must have been a terrible place for much of the war, and yet between the end of Second Ypres in May 1915, and the beginning of Third Ypres in July 1917, no major battles were fought here (a few notable events took place, the International Trench raid and the first use by the Germans of phosgene gas being two), but little is published about warfare here during these two years, as if nothing much happened. And yet the close proximity of the trenches almost guaranteed that death would be a daily visitor, and as we will see later in the tour, less than half a mile from here the number of dead men found nearly twenty years ago in a very small area of the battlefield during archaeological excavations, before the builders moved in to construct the industrial state across the canal, is staggering. This must have been a terrible place. Nonetheless, the front lines stabilised, following the end of the Second Battle of Ypres in May 1915, on either side of the canal, the French front line following the western bank, the German front line along the eastern, until the Third Battle of Ypres began on 31st July 1917. …and as I had plastered the aerial photo right over the field through which these linking trenches were constructed in the last shot, here’s the unadulterated field, in more ways than one, the white railings of the lock also visible past the trees on the left. Two more aerial photos of the Boesinghe bridges, the top left inset showing the railway bridge, and the lower right showing, well, what, exactly? Despite the absence of the stretch of the bridge that was still standing in the earlier photo, this is Boesinghe road bridge once again, and maybe you now identified it before I named it. As I said, the shape is unmistakable. 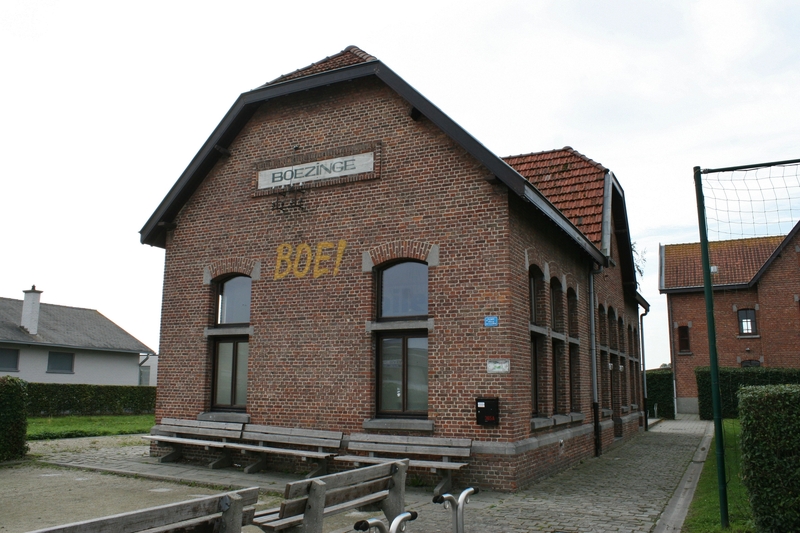 The signpost points us to the centre of Boesinghe, and that is where we will find ourselves next post. Ah, Morag. Thank you so much. I seriously doubt that many people understand the significance of the bridge, and it is not the last mention of it, as you will see when you read the following few posts. Researching all this was very interesting, extrapolating the relevant stuff without writing a book taxing (wait till we get to Yorkshire & International Trench, much later in the tour, which I have been writing and researching for months now), but I hoped I’d got this one about right, and your comments are most appreciated. We shall encounter the cycle route to Langemarck again at the Carrefour des Roses later in the tour.